Back in 1997/8 my brother and I finally got our hands on the excellent Sony PlayStation. There were two games we ended up renting and eventually purchasing. 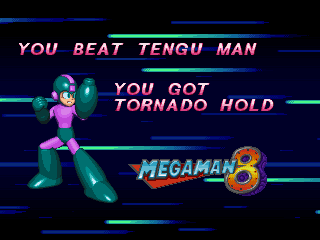 The first one being Mortal Kombat Trilogy, which was cool, but the real star of the show in my eyes was the other game Mega Man 8. Just looking at the title screen brings me back to my childhood. 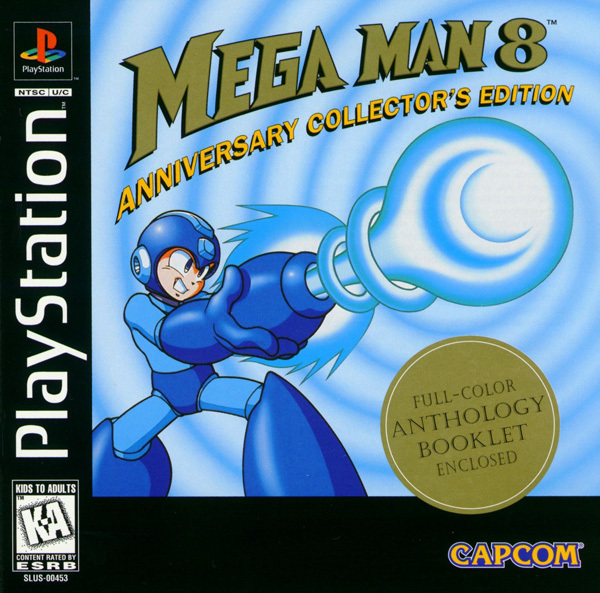 Mega Man 8 was the first new game (I’m not counting Wily Wars or the Game Gear game) in the classic series to make the jump on a non Nintendo system. In fact it was originally going to Nintendo’s direct rival at the time: SEGA. 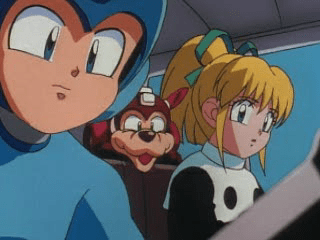 However Sony, trying to make their mark in the gaming industry, apparently asked Capcom to release a version of Mega Man 8 on the PlayStation. It was a good thing they did, otherwise this game probably would not have sold as well as it did. This intro is so cool! You start up the game and you notice that the game is not 8 bit ZOMGAWD WHY? Also what is the deal with Dr. Light? He sounds like a drunk Elmer Fudd. COME ON GAME DESIGNERS WHAT WERE YOU THINKING? Anime cut scenes? I thought this was Mega Man not Happy Weeaboo Fun Time! What was going on at Capcom in 1996? Jump, Jump Slide Slide? More like Dumb, Dumb, Lame, Lame!!! Mega Man gets a motorcycle what is this, Akira!? Capcom, what were you smoking? When I call Rush he just comes in and falls asleep. JUST LIKE ME WHEN I PLAY THIS GAME! Is Mega Man a guy or girl? Make up your mind game designers! Mega Man Y u no 8-bit? 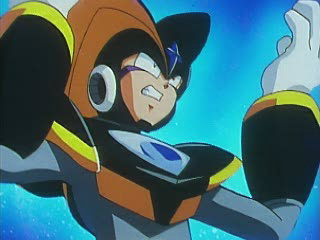 The story of Mega Man 8 goes as follows: Two robots are fighting in outer space and crash on Earth. One of the robots has what is known as the “Evil Energy” which Dr. Wily is trying to get his hands on it so he can rule the world. 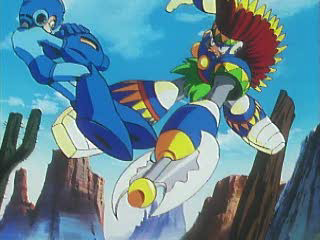 Mega Man is out to stop Dr. Wily once again and retrieve the Evil Energy from him. There is fan speculation that this so called “Evil Energy” would later become the Sigma Virus in the Mega Man X series. This has not been confirmed by Capcom, so for now I will just label it as fan fiction. It is fanfiction, like this wincestful pairing…. After the cool animated opening, you play an introductory level to get you used to the mechanics. As you will probably notice, the game looks really good. The sprite work is fantastic! 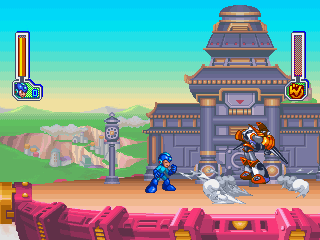 Mega Man and enemies are very well animated with plenty of delicious frames in their animations. 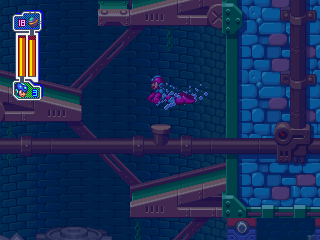 Mega Man 8 uses slightly darker colors than Mega Man 7, so the game is not quite as bright as that one was, but I think this change was for the better. Another improvement is that the levels are much larger to accommodate how tall the sprites are, something that the previous game could have done a better job at. Some people claim that Mega Man ‘Feels weird’ and is slower in this game, I think this is just people getting used to the larger levels. The levels are so busy and lively! 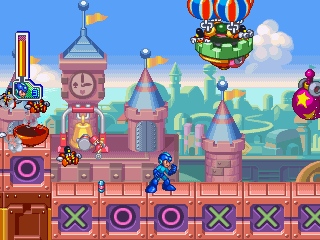 After you move Mega Man around a bit, you are introduced to the Mega Ball. The Mega Ball can either be the most useless weapon in the game, or an incredibly useful tool that can allow you to break the game in many different ways. Mega Man creates a little ball and he can kick it in different directions or even use it as a rush coil-esque tool to help you jump higher. 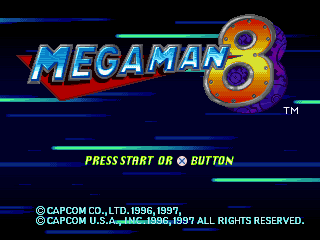 Mega Man 8 is also the first game in the series where you can actually swim! Unfortunately, I felt this ability, while nice, was very underused in the game. Mario has been doing this since 1985, get with the times Mega! After you finish the level and find the remains of Duo, a mysterious extraterrestrial robot, you are brought to the boss selection screen. It is super colorful and looks like a dance floor to me. This is also the first game in the series that lets you replay the intro level. 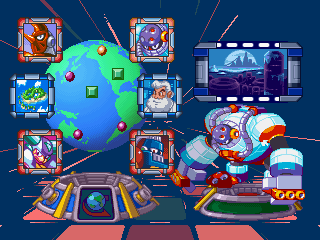 Like in Mega Man 7, you can only select four robot masters initially, and once you complete the mid stage, you will have access to the other side of the world and the other Robot Masters. This makes the game much more story driven, and as a result, more linear. One upside is that it makes it easier for first time players to find a starting point. Unlike Mega Man 7 there is no password to enable all 8 from the get-go, so you are going to have to deal with it. Speaking of the robot masters, they are a very wacky bunch this time. You have examples like Grenade Man who laughs and giggles as you attack him and Clown Man who screams for his mom in the middle of the fight. There is even a weird glitch in the anniversary collection where Sword man and Search man have high pitched voices during your second encounter with them….. I don’t know if my copy of the game is messed up but it is something weird that always seems to occur. 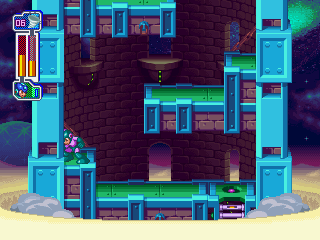 This building is collapsing and Mega Man is standing there bashing his head against a wall…. As a kid, I used to think Tengu was supposed to somehow be short for ‘tangle’ (I was a very ‘interesting’ boy). It did not help that when you use his weapon on Clown man, he does in fact get tangled up. When I got older, I learned that a Tengu is actually a creature of Japanese folklore with a long nose. Tengu written as 天狗 literally translates to ‘heavenly dog’. In other words, a tangled dog of the heavens with a nose rivaling Pinocchio! In the Japanese version, he has an attack where he yells “Kamikaze”. This was changed in the English version to “Kamaitachi”, which is a Japanese word referring to a supernatural monster that can slice things up with the power of the wind. This is an especially interesting case of localization, as the name in the translated version makes more sense in context. At least his weapon is in English!